Sales may have been helped by the unusually warm weather. The average temperature was 51.1 degrees Fahrenheit, the warmest on record for the month in the past 117 years, according to the National Oceanic and Atmospheric Administration. The economy expanded “at a modest to moderate pace” from mid-February through late March as manufacturing, hiring and retail sales strengthened, according to the Federal Reserve’s latest Beige Book report. The central bank is maintaining its benchmark interest rate near zero until late 2014 to encourage economic expansion. Americans spent more on building materials, cars, electronics, furniture and clothing in March. A separate Department of Commerce report showed that American companies restocked at a steady pace in February, which suggests that businesses expect consumers to continue spending this spring. The retail sales report is the government’s initial monthly look at consumer spending, which represents 70 percent of economic activity. The increase, along with other positive data on inventories and trade, suggests growth in the January-March quarter could be stronger than first thought. Economists are estimating growth at an annual rate of between 2.5 percent and three percent in the 1st quarter, which is in line with the annual pace reported for the October-December quarter. Americans are feeling greater confidence in the economy after seeing hiring strengthen over the winter. Job gains were typically 246,000 per month from December through February. Corporate stockpiles rose a seasonally adjusted 0.6 percent, according to the Commerce Department. That’s less than January’s upwardly revised gain of 0.8 percent. The increase pushed stockpiles to $1.58 trillion which is nearly 20 percent more than the recent low hit in September 2009, just after the recession ended. Sales grew faster than inventories in February, rising 0.7 percent. This is a good sign because it is evidence that companies aren’t building too much inventory, which can result in cutbacks in production in the future. “The pace of inventory building is consistent with what you’d expect to see in a gradual expansion,” said Tim Quinlan, an economist at Wells Fargo. Businesses are rebuilding their stockpiles after cutting them over the summer in fear of a double-dip recession. Steady inventory growth in the 1st quarter, as well as a narrower trade deficit in February and stronger retail sales, has lifted the outlook for growth. Sales soared 16.7 percent over the same period last year to $52.4 billion, according to the NRF. “American consumers are taking a deep breath and making the decision that it’s okay to go shopping again, in spite of high unemployment and uncertainty over the stock market and housing market,” Davis said. The results for the initial holiday shopping weekend are proof that retailers’ efforts to tempt shoppers during the weak economy are working. Some like Wal-Mart and J.C. Penney are making a stronger push online to compete more effectively with rival Amazon.com. Major chains like Macy’s, Target, Best Buy opened their doors at midnight on Thanksgiving evening instead of the pre-dawn Friday hours of years past. The question remains whether retailers’ will be able to hold shoppers’ attention throughout the rest of the season, which can bring in 25 to 40 percent of a merchant’s annual revenue. Americans remain driven by deep discounting and they’re conscious of their spending budgets. Even as they spent money, shoppers said that with the high price of gas and other goods, this is not a good time to spend, according to the Bloomberg Consumer Comfort Index. Retail sales grew a paltry 0.5 percent in October, slowing from 0.7 percent in September, according to the Department of Commerce. In the weeks just prior to Black Friday, ShopperTrak reported sales had risen 3.6 percent during the week of November 12 and 3.8 percent during the week of November 19, compared to last year. Analysts were surprised by the number of shoppers and the amount of spending; they had expected sales to be dampened by the nine percent unemployment rate, the high costs of gas and concerns about fiscal upheaval in Europe. It is uncertain whether retailers will be able to maintain the early momentum for the rest of the season. “One swallow does not a holiday season make. 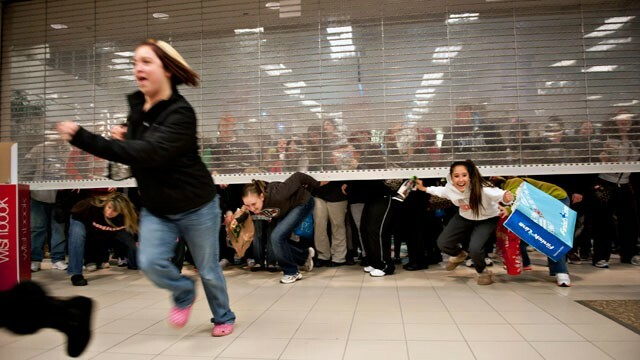 After the deepest recession in decades, the solid Black Friday weekend is welcome news, but we’re only in the second quarter of a long playoff game,” said Craig Johnson, president of the consulting firm Customer Growth Partners. American shoppers spent $816 million on Black Friday without leaving the comfort of their computer chairs, a 26 percent increase over 2010, according to ComScore data. The results reinforce numbers released by IBM Coremetrics that showed online sales on Black Friday grew by 24.3 percent compared with the same period in 2010. Approximately 50 million shopped online Friday, a 35 percent increase over last year, ComScore reported. “Each of the top online retailers generated significantly greater Black Friday activity compared to last year,” ComScore Chairman Gian Fulgoni said. “Amazon.com once again led the pack, with 50 percent more visitors than any other retailer, while also showing the highest growth rate versus last year. However, it is telling that the top multi-channel retailers also showed strong growth in visitors, demonstrating the importance of the online channel to the retail industry as a whole.” Amazon, Wal-Mart and Best Buy all reported double-digit percentage gains over last year. Tags: Amazon.com, Best Buy, Black Friday, Bloomberg Consumer Comfort Index, Department of Commerce, J.C. Penney, Macy's, National Retail Federation, ShopperTrak, Target, Thanksgiving, Wal-Mart Stores Inc.
Black Friday – the day after Thanksgiving notable for its power shopping – just got longer as several leading national retailers announced plans to open at midnight. Instead of sleeping off that turkey coma, throngs of shoppers will be waiting in line at Macy’s and Target, both of which will open four hours earlier than normal. “People want to shop through the night,” said Martine Reardon, Macy’s executive vice president of marketing. She said the expanded hours were in response to customers’ requests. One year ago, Macy’s opened eight stores at midnight, and the rest at 4 a.m. According to Reardon, the midnight openings were highly successful. Retailers have been extending their Black Friday hours for several years; additionally they’re trying to outdo each other by announcing some of their best deals weeks in advance. They also are responding to shoppers who strategize bargain-hunting weeks in advance. Already, Black Friday circulars are starting to be leaked to deal sites like Blackfriday.com and Blackfriday2011.com. Just a few years ago, stores were secretive about their discounts and hours until a few days before Thanksgiving. Some retail industry experts think the early openings are a bad idea. The news is not good for workers, many of whom are desperate for jobs. “What these retailers have to worry about is: Are they going to have an employee revolt?” said retail analyst Britt Beemer, chairman of America’s Research Group. “You could be pushing people to the limit of what they are willing to accept.” Beemer’s research suggests this Black Friday will be the biggest ever, with 50 percent or more of consumers heading out to shop the day after Thanksgiving. 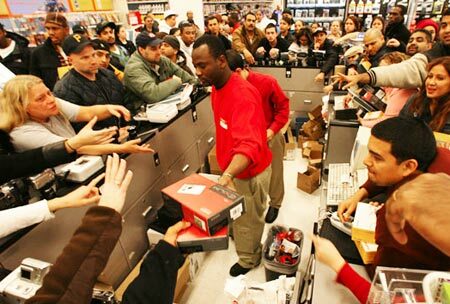 And for the sake of the craziest shoppers, this year’s deals should be worth losing sleep over. “Consumers are really walking a tightrope here. They don’t have much room and it’s easy for them to lose balance with very modest shifts in hiring, the cost of food and everything,” said Steve Blitz, senior economist, ITG Investment Research in New York. According to a recent study, a 100-point scale, a 10-point increase in walkability increases property values by one to nine percent, depending on the property. Chicago – with a Walk Score of 74 — was one of the nation’s most walkable cities. The others are New York, Boston, San Francisco, Washington D.C., and Philadelphia. The least walkable cities are Jacksonville, Nashville, Charlotte, Indianapolis, Oklahoma City, Memphis, Fort Worth, Kansas City, San Antonio, El Paso, Austin and Phoenix. The Loop and the Near North Side were rated as Chicago’s most walkable neighborhoods with Walk Scores of 96 each. Just five percent of Chicagoans live in car-dependent neighborhoods. Illinois’ most walkable city is Forest Park – in the near western suburbs — with a Walk Score of 82; the least walkable is Godfrey – near downstate Alton — with a score of just 20. Although tracking the number of Christmas tree sales is virtually impossible, a Harris Interactive poll shows that approximately three percent of the 28 to 30 million farm-grown trees are now sold online. Dungey believes that having Target’s broad consumer reach is a welcome way to sell trees. “It signals that retailers recognize that not all consumers are equal. Whether you’re a big-box or a specialty store or a farm itself, good retailers realize they want a broad array of buyers. Not everyone wants to buy a tree the same way,” Dungey said.